13:54 left in the second and we are tied 1-1. UM leads SOG 15-6. Refs looking at a potential #Gophers goal to see if the puck crossed the goal line. Welp, hockey is a game of inches and we are still tied 1-1. However, Badgers head to their first PK of the game with 13:36 to go. Replay I'm seeing shows Pitlick's shot hitting the left post and coming back along the line. There was no goal signal on ice. BADGERS GOAL: Kunin's shorthanded shot stopped but Aidan Cavallini scores on the rebound. 2-1 UW with 12:38 left in the second. SHG, Wisconsin. Cavallini picks up a rebound and puts it in to make it a 2-1 game. Gophers get :30 of 5-on-3 after Greenway is called for slashing. 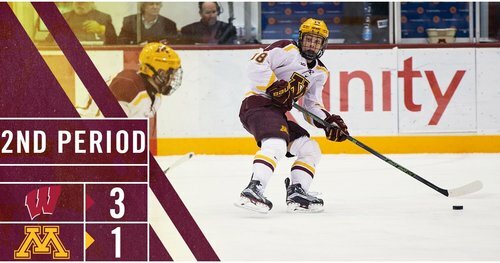 #Gophers will have a five-on-three advantage as Sheehy has his stick slashed away. Greenway takes a penalty and Minnesota will have a 5-on-3 for 30 seconds. Badgers kill the 30 seconds of 5-on-3 thanks to a Kunin block of Sheehy and Sheehy later firing wide. First Badgers PK expires. 1:30 of 5-on-4 for Minnesota. Bristedt rang the crossbar/post corner and it stayed out. Kill! Badgers kill off both penalties and we are back to even strength! 2-1 Badgers with 10 to go in the second frame. WISCONSIN GOAL! @SamanthaCogan +1. #Badgers lead 4-0. 3:21 left in the second period. Schierhorn freezes for a media timeout with 8:03 to play in the second. #Gophers trail 2-1. Good shift for UW's Freytag-Hughes-Johnson line. 8:03 left in the second, UW leads Minnesota 2-1. End of two: #Badgers 4 || Minnesota State 0 - Badgers score 4 in the period: McKibbon (x2), Pankowski and Cogan. Good period for UW. #Gophers will head to the PK as Bischoff is called for hooking. Media timeout with 4:22 to play in the second. Minnesota's Bischoff gets called for hooking with 4:22 left in the second. UW goes on its third power play, leading 2-1. Power play coming up for the Badgers with 4:22 to go in the second. UW leading 2-1. Schierhorn takes a slap shot to the mask but recovers to cover the rebound. Hey, the net went off the pegs at Mariucci! I'm shocked! Gophers get caught with too many on the ice. Badgers back to the PP with 1:54 left in the second. Back to 5-on-5 play as the Badgers don't convert on the power play. Under 2:30 to go in the period. #Gophers assessed a bench minor for too many men on the ice. Ryan Norman to serve. 1:54 to play in the second. UW back on the power play as Minnesota is caught for too many men with 1:54 to play. One minute remaining in the second period. BADGERS GOAL: Jake Linhart fires a second time after his first shot gets blocked, and UW takes a 3-1 lead over Minnesota, 55.6 left in 2nd. PPG, Wisconsin. 3-1 game as the Badgers score three unanswered. Give Ryan Wagner the goal on a tip in front. END 2: Wisconsin leads Minnesota 3-1 on goals by Frederic, Cavallini (SH) and Wagner (PP). Shots on goal 20-11 for the Gophers. That was three goals on six shots on goal in the second period for the #Badgers .